BLP abandoned St. John Polyclinic for 14 years. Minister of Health Donville Inniss makes a good point in today’s Barbados Advocate. BLP candidate Hudson Griffith is accusing the DLP of neglect because the current government hasn’t finished the St. John Polyclinic since they came to power 3 years ago. Mr. Griffith fails to mention that his Barbados Labour Party let the clinic rot for the 14 years they formed the government. The Sparman Affair: We print Dr. Ishmael’s letter for which he was suspended and sued. Can Barbados handle the truth… whatever it is? A copy of Dr. Richard Ishmael’s letter along with 16 other pages of information has been received by every newspaper and blog in Barbados and who knows where else. All anonymously sent, of course. We’re going to start by printing Dr. Ishmael’s 3 page letter and then see where we go from there. 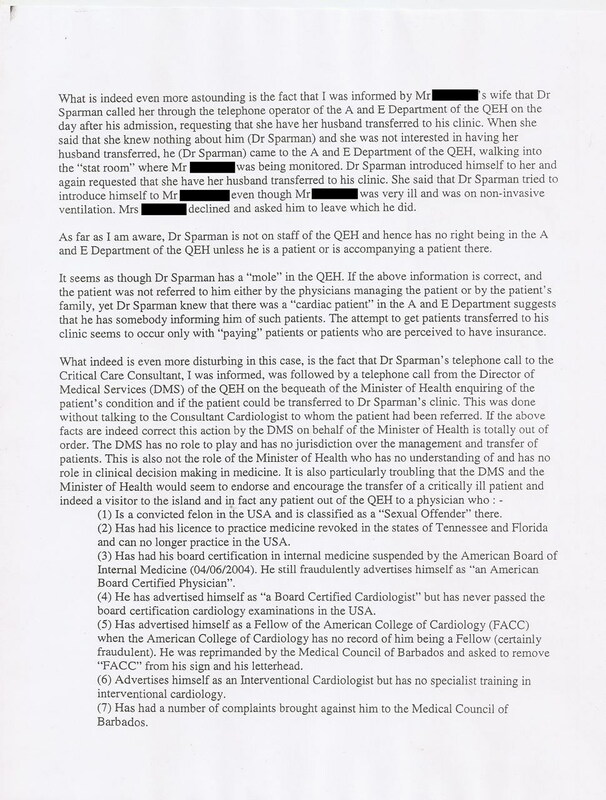 The letter contains allegations against Dr. Sparman, the Minister of Health and others – and also reveals a past complaint against Sparman that appears to have been covered up. We blacked out the name of a patient and the patient’s wife who both figure prominently in the story. 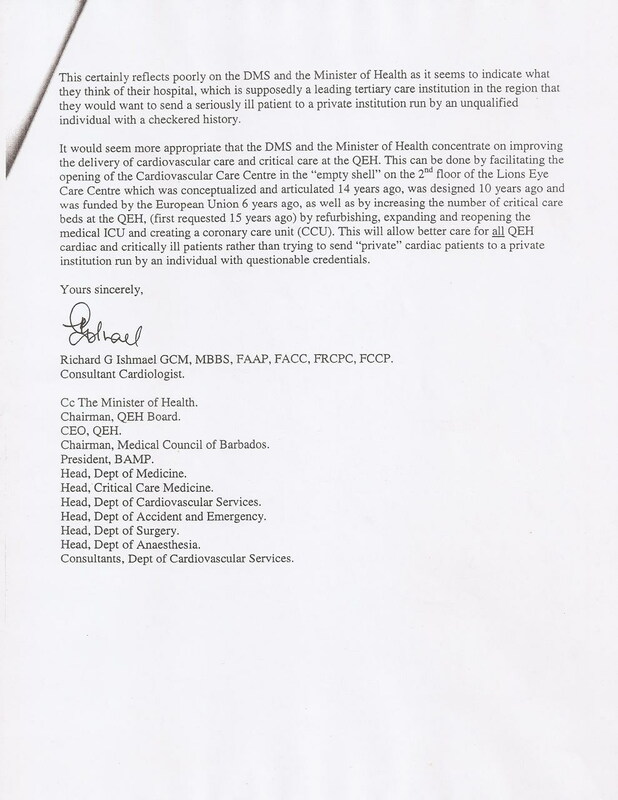 Remember that as a result of Dr. Ishmael sending the letter, the Queen Elizabeth Hospital suspended Dr. Ishmael and, according to many Barbados physicians, put many critically ill heart patients at serious risk. The letter raises many large and important questions, but our main concern is for the well being of the heart patients who are still at risk because their doctor is suspended. Is this full-page advertisement a reward for paper’s editorial support of DLP government? This self-congratulatory AREN’T WE WONDERFUL advertisement has some positive statements by two patients in the Accident and Emergency (A&E) department who were treated soon after their arrival, an assurance by the Board of Directors that more staff is being hired and some positive statements about how wonderful the nurses and doctors are. This advertisement is not a proper use of the tax dollars and other public funds that go to health care and the Queen Elizabeth Hospital. How much did the full page ad cost? Wouldn’t spending the money directly on health care have been a better use? Who decided to place this advertisement? Is it part of a larger campaign? 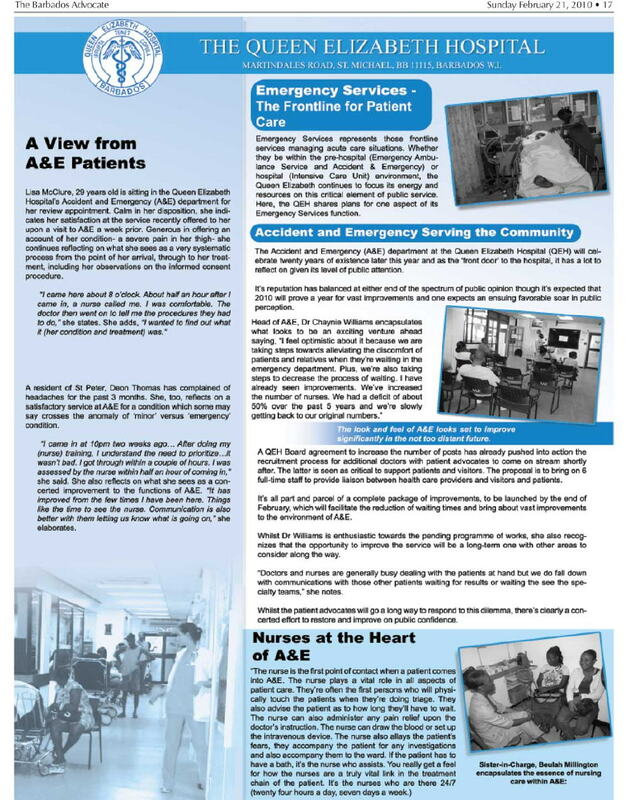 I noticed that the Barbados Advocate recently published a series of positive news articles about the QEH. Is this full page advertisement payment for those positive stories? Is is a way of directing government revenues to a newspaper that is generally supportive of the current government? Is the advertisement “quid pro quo” on a couple of levels? 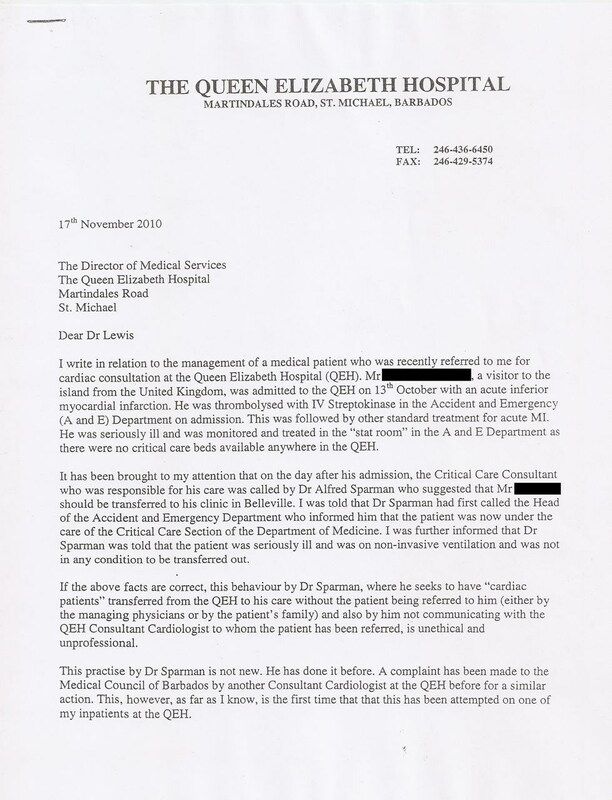 I don’t expect any answers to my questions from the QEH board, the newspaper or the government. Thank you to Barbados Free Press for the opportunity to vent. The following comment was left by BFP reader “decent boy” on our recent article Has it come to this in Barbados? Dialysis patients turned away due to shortage of needles, gloves, standard supplies. The reality is that Barbadians have come to expect international best practice standards totally free of cost, whilst Government has serious limitations on the amount of funds available. The most complex surgeries such as open heart surgery, coupled with treatment like dialysis are not cheap and cannot be gotten in most developed countries for free. I am very familiar with the issues. Furthermore, there was no compromising on the health of the patients on dialysis. 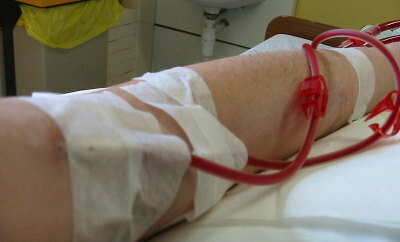 The nepthologist took the decision to reduce the number of dialysis from 3 to 2 per week. Once patients eat the right foods and do the other things that doctor orders, there was no risk to patients. Furthermore, at a cost of $52,000 per patient per year, and with the space constraint; one can appreciate the miracles at the QEH. Would someone tell us about the immigrants who have contributed no taxes to this economy but get dialysis for free; or the Bajans who have lived abroad all of their lives and because they cannot afford dialysis in the US move back to Barbados to get it. I am satisfied that this Government is taking health seriously, and I agree with the policies announced by the Minister to date. He walks the place regularly and see for himself what is happening. Unlike others, he is not a snob, and can be seen hanging around talking with all and sundry, trying to understand what is happening. The electrical upgrades, refurbished cafeteria, upgraded doctors lounge, additional posts, two new ambulances, a new cardiac suite, getting MICU and NICU suites back in operation are a few of the facts under this new Minister of Health and DLP Government. Staff at all levels are respected and embraced. Patient care is becoming the priority. Barbados’ healthcare system is not perfect, but it certainly is good. We just need to take our own health a lot more seriously and pay more taxes towards healthcare. Editor’s note: * The original comment said “a proper” but we think the writer meant “improper”. Decent boy, please let us know. Thanks! THERE IS a shortage of supplies in the dialysis unit at the Queen Elizabeth Hospital. And patients who rely on the unit’s blood purifying service fear their lives may be on the line. “[The hospital] is short of equipment and people are literally afraid for their lives,” said a patient who spoke under anonymity. Gloves, needles, and other items were needed, said the patient who added that waiting periods for dialysis treatment had lengthened. I wonder if politicians, civil servants and administrators in Barbados really get the fundamentals of their jobs. Hardly a day goes by that we don’t hear of another crisis or emergency that is simply the result of poor management, out and out neglect or irresponsible prioritisation. Or no prioritisation. We’re still waiting for the seven hundred yachts to show up for the games as then Tourism Minister Noel “Instant Millionaire” Lynch predicted. Oh sure, we can set up Community Councils to distribute the biscuits and beef to the party faithful – but you want water in the pipes so factories don’t burn down? Ha! Water in the pipes for firefighting would cut into the biscuits doan ya know? “Oh… we’re a hundred police officers short and we can’t hire enough qualified candidates because we pay garbage truck drivers more than police officers? That’s too bad. We better lower our hiring standards then” say the politicians. And so it has been for twenty or more years in Barbados. Our government Ministers drive nice shiny cars and four by fours while our firefighters beg and scrape for 20-year-old used equipment from New York City. Some of our police officers are barely literate. Ya get wat ya pay for, folks! 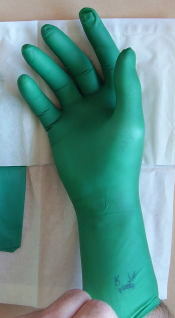 Lots of money for bread and circuses at Crop Over, but our nurses lack surgical gloves, needles and other supplies to look after the dialysis patients that must have treatment or die. Every day I or one of the family stayed with my son and kept him clean and brought him food. This was necessary because of the lack of food, bad food when it came IF it came and the lack of trained nurses and supplies. Especially supplies. None of the ward toilets where my son was had paper, none had soap or paper towels for drying. Everyone must bring their own. Barbados Government Triumph: Little Brass Bells Issued To Bedridden Hospital Patients! Working Conditions At Barbados Queen Elizabeth Hospital - QEH washroom photo from an earlier Barbados Free Press story - click photo to read. Editor’s Note: The below was anonymously submitted to Barbados Free Press. If any of our readers have any reason to question its authenticity or the accuracy of anything it says, please speak up. That’s how we fact-check at BFP: we encourage our readers to become involved. The following is a Press Release concerning conditions affecting the Junior Doctors at the Queen Elizabeth Hospital. It was submitted to the Print Media in Barbados by The National Union of Public Workers (NUPW) on 2009-February 9. The Print Media has refused to carry it in whole or in part. The release was suppressed. It was apparently not considered important enough to be newsworthy. If you disagree (and I really hope you do), please feel free to pass it on via E-mail, Facebook, Myspace, MSN etc. The TRUTH must be told! The Junior Doctors of the Queen Elizabeth Hospital are amongst the most hardworking and dedicated Civil Servants in the country. However the conditions under which they work are less than ideal and in many cases appalling. Juniors Doctors make up the majority of doctors working at the Hospital. They are not allowed to have private patients or to charge any individuals fees for their services (either inside or outside the Hospital). The term Junior Doctor is a very misleading one and must be clearly defined before we progress further. A Junior Doctor simply put is any doctor employed at the Hospital who is not a Consultant. This group encompasses House Officers (Interns) who have recently graduated and Senior Registrars, who hold post-graduate qualifications and are eligible to be appointed as Consultants should a vacancy arise. They are many other doctors who are between these two extremes included in this group. It is important to emphasize that the term Junior Doctor does not mean a young, inexperienced doctor or unskilled doctor. Consultants are the leaders of the clinical team. They conduct ward rounds and provide invaluable input and guidance into the management of individual cases. Often the consultant’s directives are carried out by the Junior Doctors. These directives can range from simply carrying out various blood tests to performing complex surgical or invasive procedures. It is therefore obvious that the Junior Doctors are a highly skilled, valuable and integral part of the clinical team and essential to the optimal functioning of the hospital. Currently the Junior Doctors at the Q.E.H. are working under very demanding and trying circumstances yet continue to give of their best. Many Junior Doctors work seven (7) days a week and some are on call every third day (mainly in the Department of General Surgery). Rarely they can be on call on alternate days. When on call these doctors are responsible for providing care to inpatients as well as dealing with ALL emergency cases for a period of 24 hours. When “on call” finishes, these doctors are then required to work their regular working day. This results in many doctors working (and being in the Hospital) for 36 consecutive hours. Total working time often exceed 120 hours per week. It is of note that most hospitals (including many in the Caribbean) have moved away from this system recognizing that it is exceedingly burdensome on the doctors.More importantly it may be dangerous to patients’ wellbeing because of the increase in medical errors that occur. Hospitals throughout the world (especially in Europe & U.S.A.) have actually limited the amount of hours a doctor can work to approximately 70 hours per week. Doctors can be (and have been) removed from hospital premises by security if found to be in contravention of this policy. Even more worrying is that even with these makeshift sleeping arrangements, there is not enough room for all the Junior Doctors on-call and some have been forced to resort to sleeping in their cars. Clearly one can see this is an inherently dangerous and undesirable situation. Many cars have been broken into, including those of doctors on the Hospital premises. To make matters worse the Junior Doctors are not provided with warm water in any part of their lounge and are therefore forced to shower in ice-cold water at all hours of the day and night. The Junior Doctors Lounge is itself woefully inadequate. There are broken chairs and couches strewn throughout and there is not enough space for the over 150 Junior Doctors employed at the Hospital. Up to last year the doctors were competing for the sparse space in the lounge with an infestation of rats. Also worrying is the fact that there is no canteen facility available for the doctors (or any of the Hospital staff for that matter). In essence, what this means is that The Junior Doctors are essentially forced to order in fast food or go for prolonged periods without eating. Doctors are consuming the same sugary and fatty foods that they tell their patients to avoid. It is the norm that in hospitals of this size which by necessity are open 24 hours that there is a canteen catering to staff (and visitors) that is also open 24 hours a day. For example Kingston Public Hospital (in Jamaica) has facilities whereby an on-call doctor is provided with lunch, dinner and then breakfast the next day! The cafeteria at the QEH has been closed for years and all hopes of it being re-opened were dashed when they decided to use the existing space for a new clinic. These are just a few of the many challenges that the Junior Doctors are facing. The logical question which begs to be asked is “What have the Junior Doctors’ done to improve their situation.” All of the aforementioned issues have been brought to the attention of the Hospital’s Administration. Despite being in constant negotiations with the Hospital Administration, the Junior Doctors have received little more than empty promises of improvement which have up to this time failed to materialize and conditions have continued to deteriorate rapidly. The Junior Doctors perhaps have the worst physical amenities of any group employed to the Q.E.H. The conditions are certainly not up to the standard that trained professionals in ANY OTHER field (here or abroad) would expect or tolerate. In terms of remuneration and compensation, the Juniors Doctors at the Q.E.H. are earning the lowest when compared to their counterparts in the Caribbean performing similar roles, our Junior Doctors are however working the longest hours in the worst physical surroundings. The doctors at the QEH are at their ‘wits end’. They work ridiculous hours and are still expected to function. They have to sleep at the hospital but there is no where adequate to sleep (if they get to sleep at all); they have to eat but there is no food and on top of that, they have to bathe at the hospital but they have to do so in cold water! These doctors give their hearts and souls to their profession. All they are asking for is a salary commensurate with their hard work, improved working conditions and an environment that fosters morale and not discontentment. In spite of the many challenges and difficulties facing the Junior Doctors they are committed to giving of their best. They love their jobs. All of them accept that some personal sacrifice is necessary by the nature of the practice of Medicine. They however remain hopeful that some improvements can be made to this untenable situation they find themselves in, before they transition from being doctors to patients. 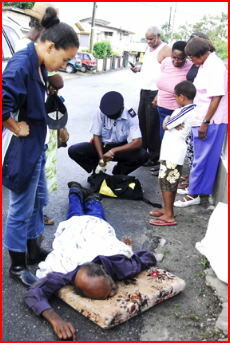 Barbados Ambulance Won’t Come, So Passersby Call Newspaper Reporters – Then Ambulance Comes! This would be hilarious if people weren’t dying for lack of ambulance service on Barbados. Nothing happens for an hour and a half!!! Then a passerby gets a bright idea and calls the newspaper. Daily Nation reporters headed for the scene call the ambulance and say “What happening here?” After the reporters arrive on the scene the ambulance pulls up and takes the man to the Queen Elizabeth Hospital! If you need an ambulance in Barbados… call a newspaper reporter! God, I love this island, but I hate the “island time” third world standards and attitudes that keep us down.